Sturdy Steel Construction with Green Powder Coating. Large worktop with Anti-slip Surface Seven Lo..
W534 x D218 x H288mm. Weight 7.4kg..
W668 x D458 x H885mm. Weight 62.2Kg Ball Bearing Slides. Castors Included..
W660 x D307 x H377mm. Weight 25Kg. Ball Bearing Slides.. 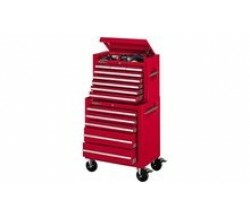 The Stanley 1-92-902 professional, heavy-duty, mobile tool chest has a strong polycarbonate lid and ..